Oracle is a freeware program for windows for all kinds of oracles. It can do tarot, Itjing and various other divination systems. It is highly customizable, you can define your own spread, or your own cards etc. This contains the Itjing, a small Rider deck, the Aquatic deck, English and Dutch languages and helpfiles and some spreads. This is a program for Itjing, Tarot cards or other spread methods. You can define or 'plug in' your own deck of cards as well as your own spread methods, the program is highly configurable. Spreads are automatically saved, at startup the last spread is always displayed. When more then 50 spreads are saved, the oldest ones are deleted. To do a spread with cards, first select a deck in the Deck menu. When you first install Oracle, the Aquatic deck is active. You can see the number of cards in the deck, for a tarot deck this is always 78. Then choose a spread in the Spread menu. The first card is shown and the program waits for a keypress or a mouseclik and then the subsequent cards are drawn. Cards can be moved around with the mouse. A double click on a card in a spread will show that card full size. Press F4 or escape to go back to the spread. Mostly text fields and the like can be sized with the mouse. If the toolbar is visible (see Settings - Show Toolbar) you will see two edit boxes with arrows. The left one changes the size of cards, the right one changes the width of cards. Loads a saved spread. The names of the spreads are composed of a part with the date and time (yy-mm-dd) and the name of the spreadmethod, for instance '03-12-08 21.22.38 Chakra.ora'. Saves the current spread. Although this is done automatically this can be desired if you have chosen another deck of cards to display the spread and you want to save the spread with this deck. Besides you can supply a name for the spread yourself. If you supply a name that does not start with a digit, like 'my birthday 03-03-14 21.22.38 Chakra.ora, the spread is never deleted even if it becomes old. This lets you browse the available decks. This is like when you choose another deck in the Deck menu. If a spread is displayed on screen and the new choosen deck contains the same number of cards as the one used in the current spread, the current spread is redisplayed with the new choosen deck. Lets you browse through the current deck. You can vieuw a certain card and then choose another deck with the same number of cards to view the same card from another deck. Press F4 or escape or clcik a card to go back. The editbox for changing the size of cards is disabled in this mode because cards are shown at maximum size. You can enable changing size again by checking the box inbetween the two editboxes. This is a little editor for making spread files and such. After closing the editor the program scans it's map again for spread en card files. See below for special editor functions. Displays or hides the list with saved spreads. You can browse the saved spreads. A right mouse click opens a menu to delete or rename a file. Use this to store spreads you have made outside Oracle. First turn on Diary, then choose a spread. You will see the spread but all cards will show the back side. Now if you right click on a card you can select the card you want. The spread is automatically saved with a name beginning with an underscore. First choose a deck in the menu Deck, then choose a spread from here. See below to define your own spreads. If a spread is displayed on screen and the new choosen deck contains the same number of cards as the one used in the current spread, the current spread is redisplayed with the new choosen deck. See below to define your own. Hides or unhides the box with the interpretationtexts. You can also size this box with the mouse . Shows or hides the toolbar. If you have dragged cards to a new position you can save the current positions of the cards for this spread method. All spreads with this method will be shown in these new positions. Enables or disables the hints that display when the mouse is over a card. Toggles full screen mode. If full screen mode is on, you cannot see the menu but you can use the shortcut keys. Press F11 again or escape to turn of full screen mode. If a certain oracle has more then one interpretation file, here you can choose which one you want to use. For exampe for the tarot there is an interpretation file in Dutch as wel as English. 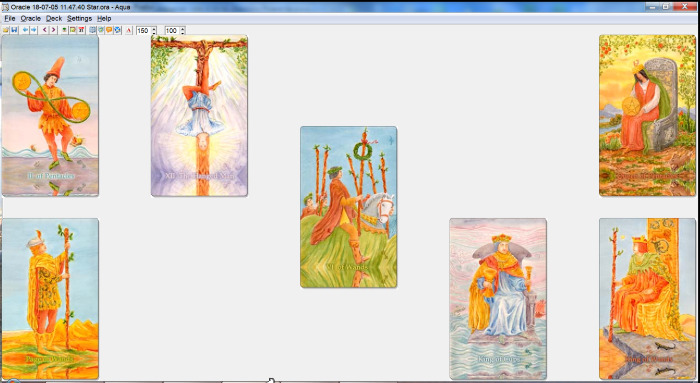 First choose on the left for tarot, then choose on the right for the texts you want to use with the tarot. Choose the language yuo want to use. Here you can define the size of the images for each deck of cards individually. If the toolbaar is visible you can also set the size with the editbox. Allowed values for cards are 10 - 300, for Itjing 100 - 200, other values are ignored. You can switch between two methods for the itjing, the 'normal' way has a chance of 1 in 4 for a moving line, the Yarrow Stalks method has a chance of 1/16 for a moving yin, a chance of 3/16 for a moving yang, a chance of 7/16 for normal yin and 5/15 for normal yang. Sets the font for the texts. * The editor - This is an editor with the normal edit functions like copy, paste etc. It has two special functions. Enter the number of cards and a file will be generated with this amount of # and the like to use as a template for a new spread. This is a function to help add your own decks into oracle. See below for explanation. * Define your own spread. You can do this by making a textfile with extension '.spr' (spread). When you next start the program or when you quit the editor the changes will show up in the menus. The layout of this file is as follows: each position will begin with a #, then a number for the horizontal position, then a number for the vertical position, and at last a text describing the position. . The numbers for horizontal/vertical position represent the percentage of screenspace, meaning 0 horizontal is dead-left on the screen, 50 in the middle etc. This is the second card. This is the third card. Note, you can also move the cards around by dragging them to positions and then use Settings - Save Position to define the positions. See for instance www.tarotspreads.com for more ideas for spreads. * Define your own deck. For a deck 3 things are needed: a map with the actual images (bmp or jpg), a textfile with the filenames of these images and a textfile with the description of the cards. The map with the images should be a map in the program directory, for example 'c:\Oracle2\MyDeck\'. The textfile with the filenames of the images should be put in the program map and should have the same name as the map with the images and extension '.car', for instance 'MyDeck.car'. After the filenames for the pictures should come a line starting with a # and then either the name of an ordinary textfile (*.txt) which then will be used as interpretation texts for these cards, or the name of a so called pointer file. This is because a deck can be associated with an interpretation file in 2 ways, directly by providing the name of a textfile (*.txt) after the #, or by providing the name of a pointer file (*.ptx). This is usefull if there are several interpretation files for a given deck of cards, for instance in different languages. A pointer file should look like this, first an asteriks *, then the name of one of the supplied textfiles, then a space and lastly the number of cards in the deck. The file with the descriptions should also be put in the program map. Descriptions should be separated with a # and there should be as many descriptions in the file as there are cards in the deck. The file with the descriptions can also contain a single line containing a * and a filename. This filename will then be used as the file for descriptions. The cards menu in the editor has some functions which can be useful when you add a deck yourself. First you are asked for a map. A deck for oracle should have it's pictures in a map under the map of the program. You can select an existing map (you can also doubleclik on a map) or fill in the name of a new map in the field 'new folder'. When you press Ok and the field 'new folder' is not empty and that map does not yet exists, you are asked if you want to create it. If a .car file already exists for this map it is loaded. After that the map is scanned for additional pictures. A new window appears with on the left a list with the .car file and/or other found pictures. On the right you see the current picture. Now you can change the order of the pictures by dragging en dropping them to another place in de list. For instance to be consistant with the interpretation texts a tarot deck always must start with the Great Arcana, then come cups, then wands and so on. This can also be done with selections. If you are satisfied with the order you can save the list (alt-F2), the list will appear in the editor as a .car file. Now you can add a line with a # and an interpretation file as described above. Then you save the .car file from the editor and you are ready to use your new deck. Righthand mouse click on one of the files in the box will present a menu with rename and delete for that file. Closes the window and shows the list in the editor as a .car file. Closes the window without saving. This is a function specially for tarot cards. Make a selection in the list and then use this function to rename that selection to the appropiate tarot part. Select for instance 14 cards, then choose rename and enter 1, those cards will be renamed to cups01.jpg, cups02.jpg etc. This will rewrite all the cards in the map to the size they have in the right window pane. Everything in the map will be overwritten, make backup first! This should be used only to change the filesize of a deck. Changing size of cards can easily be done in the program itself. Enter the name of a map and all jpg's from that map will be copied to this map. The list will appear in the window. This will sort all jpg's in the map to date, filenames will be 'sortxxx.jpg'. I used this to sort pictures I copied from my browser's cache. This is an alternate way to select files. First check the boxes, then issue this command, then you can drag and drop these selected files. You can add help texts into the Help menu. 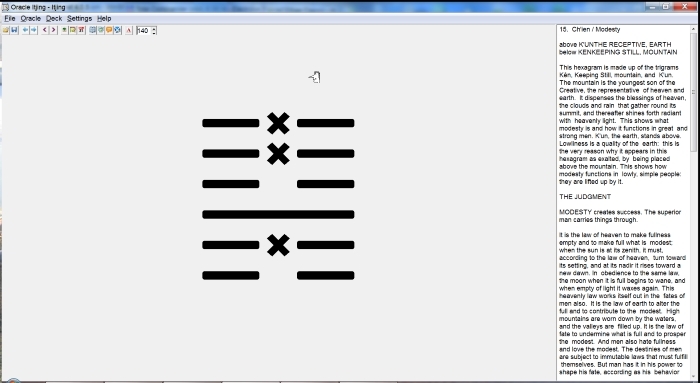 Create a textfile with extension .htx and it will appear in the menu. You can also create a file with extension .hty, this is a helpfile with extra information, for instance about a spread. These files will appear below the general helpfiles. Shortcuts for previous / next oracle are arrows left / right. This causes these keys to be unusable when editing the editboxes for size and width for cards. If you put 'ctrlarrow=1' in the .ini file in the main section Control left / right will be used for previous / next oracle so you can use the normal arrows again for editing in the boxes. In the help window you can do right hand mouse click for a menu with a font and to copy any selected text. Warning, if you are going to play with making spreads, decks, helpfiles etc. be precise. Take care that a files exists, that is has the right name and the right format. Otherwise things will not work as expected. For examples, see available files. Maximum 10000 characters per line in textfiles. This program is and should remain freeware. All rights reserved. Any distribution is prohibited without written consent from the author. In no way is the author responsible for the use of this program. Jean Cremers. December 2003. Groningen Netherlands.